For this week's post, it's time for an installment of "What can I write about the Lori analysis without giving away any results?" I figure I can reveal the taxa that didn't make it into the analysis. As I've said before, my goal was to include every named Mesozoic maniraptoromorph known from more than teeth or a single kind of element. I ended up including thirty unnamed specimens and plenty of taxa known from single elements, but it turns out TWG characters are better at placing taxa known from e.g. 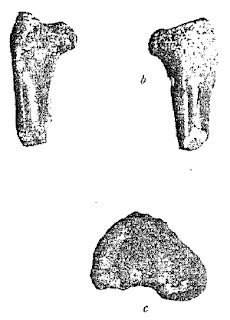 femora than frontals. So which taxa didn't make it into the Lori analysis? Taxa known only from teeth- Zapsalis, Richardoestesia? isosceles and R? asiatica, Dromaeosauroides, Paronychodon spp., Koparion, "Saurornithoides" asiamericanus. Taxa known from a single kind of element- "Archaeornithomimus" bissektensis (attempted), "Coelosaurus", Ilerdopteryx, Thecocoelurus (attempted), Ojoraptorsaurus, Kuszholia (though Caenagnathasia was; I didn't use any Bissekty composite taxa), Boreonykus (I agree with Cau only the frontal should be referred to this taxon; attempted), Cretaaviculus, "Dromaeosaurus" gracilis, Saurornitholestes? sullivani (attempted), Yaverlandia (attempted), "Saurornitholestes" robustus (attempted), Lenesornis, Platanavis, Abavornis, Catenoleimus, "Enantiornis" walkeri, "Ichthyornis" minusculus, Incolornis spp., Explorornis, Kizylkumavis, Sazavis, Martinavis? saltariensis (attempted), M? whetstonei (attempted), Nanantius, "Zhyraornis kashkarovi", Guildavis, Zhyraornis spp., Judinornis, Parascaniornis, Brodavis americanus (attempted), Apatornis, Laornis, Palaeotringa spp., Volgavis, Novacaesareala, Torotix, Austinornis, Anatalavis rex, Cimolopteryx spp., Lamarqueavis spp., Graculavis spp., Telmatornis, "Lonchodytes" pterygius, Neogaeornis, Lonchodytes, Tytthostonyx. Note there was a single Hesperornis spp. OTU. You can see I'm pretty certain there aren't enough TWG sacral or coracoid characters to usefully place taxa, and that including fragmentary Aves wasn't considered useful when the sampling of the clade is so low. Taxa published too late to be included- Anomalipes, Eogranivora and Microenantiornis, to date. But hey, we got Halszkaraptor, Ostromia, Caihong and Almas in there. I don't think these three taxa are that important to Lori's position, though Eogranivora may be important for taxa around the base of Carinatae. The chimaerical Beipiaognathus and Dalianraptor. For the former, I have no way of knowing which elements are from one individual given the three humeri and multiple pieces placed incorrectly, while the latter seems to be a jeholornithid skull, confuciusornithid wing and possibly enantiornithine feet. There was a lot of crunch time at the end, so despite including ~70 enantiornithines I decided that several enants with poor descriptions and schematic illustrations could be skipped for now- Alethoalaornis (whose holotype is missing), Cathayornis? aberransis (ditto), Cuspirostrisornis, Dapingfangornis, Largirostrornis and Longchengornis. Also the partial leg that is Confuciusornis chuonzhous. Hou (1997) is a particularly flawed paper describing four of these taxa, with illustrations that do not match the material when the latter has been redescribed as is the case for Songlingornis and Houornis (= Cathayornis caudatus). I did include Jibeinia though, since it's potentially important to ornithothoracine origins (or maybe just a misinterpreted Hebeiornis). In any case, I've since scored Alethoalaornis, Longchengornis and Dapingfangornis, and plan to do so for all of these taxa for future analyses. Juvenile enantiornithines- Liaoxiornis, Dalingheornis and Gobipipus. I did include the Catalan nestling LP-4450-IEI and Cratoavis. I've since scored Dalingheornis and Gobipipus and will have Liaoxiornis and GMV 2158 and 2159 scored for future analyses. LP-IEI-4450 and Cratoavis don't group together, so my precautions when scoring ontogenetically variable characters may have been effective. Holotype of Gallornis straeleni, right proximal femur (Royal Belgian Institute of Natural Sciences coll.) in (a) anterior, (b) posterior and (c) proximal views (after Lambrecht, 1931). The others- There were several named taxa known from multiple elements that had very unstable positions when tested. Aepyornithomimus, Tototlimimus, Valdoraptor (ceratosaurian? ), Unquillosaurus (carnosaurian? ), "Ornithomimus" minutus, Soroavisaurus, Canadaga, Maaqwi and Gallornis. The former two are known mostly from hindlimb fragments that allow a lot of leeway under TWG characters. "Ornithomimis" minutus has never been illustrated and is now lost, so we only have Marsh's description. TWG matrices were not designed to include enantiornithine or hesperornithine characters, so Soroavisaurus (tarsometatarsi plus some pedal phalanges) and Canadaga (cervicodorsal vertebrae and rib fragments) aren't well constrained. Maaqwi is only known from a coracoid and forelimb shafts. 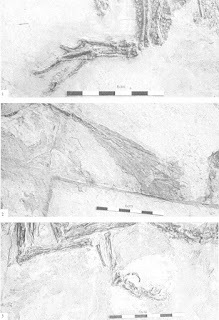 Gallornis is known from a possibly referrable fragmentary proximal humerus that was undescribed and has a photo which basically no characters can be scored from ("probably beyond evaluation" in Hope's  words), and a proximal femur photographed in three views. Corythoraptor- I somehow completely missed this taxon until last week, the billionth oviraptorid from the Nanxiong Formation. Looks similar to the Khermeen Tsav taxon with the tall cranial crest (PMO X678 cast; UALVP 49394 cast; UALVL 49393 cast). Its absence shouldn't affect much, since I don't include any of the oviraptorosaur characters from Maryanska et al. (2002) derivatives. References- Lambrecht, 1931. Gallornis straeleni n. g. n. sp., ein Kreidevogel aus Frankreich. Bulletin de Musee Royal d'Histoire Naturelle de Belgique. 7, 1-6. Hou, 1997. Mesozoic Birds of China. Phoenix Valley Bird Park, Lugu Hsiang, Taiwan. 221 pp. Hope, 2002. The Mesozoic radiation of Neornithes. In Chiappe and Witmer (eds). Mesozoic birds: Above the heads of dinosaurs. Berkeley: University of California Press. 339-388. Maryanska, Osmolska and Wolsan, 2002. Avialan status for Oviraptorosauria. Acta Palaeontologica Polonica. 47 (1), 97-116. Gao and Liu, 2005. A new avian taxon from Lower Cretaceous Jiufotang Formation of western Liaoning. Global Geology. 24(4), 313-316. Speaking of maniraptoromorphs, will next week’s post be about Peters’ terrible new bird phylogeny? But of course. A MANIAC even. Is it Feduccia’s (2016) response to Smith et al. (2015)? ...In the unlikely case that there's anybody reading this who has as little experience with fossils as David Peters, let me say for the record that even the smoothest bone is really hard to confuse with dentine, let alone enamel. If it looks like bone, it's bone, not teeth. Teeth look like teeth, not like bone. It really is that simple. "There were several named taxa known from multiple elements that had very unstable positions when tested. Aepyornithomimus, Tototlimimus, Valdoraptor (ceratosaurian?)..." All these have been classified as ornithomimosaurs. (For Valdoraptor, as you would know, this is the latest of many proposed positions over the decades.) 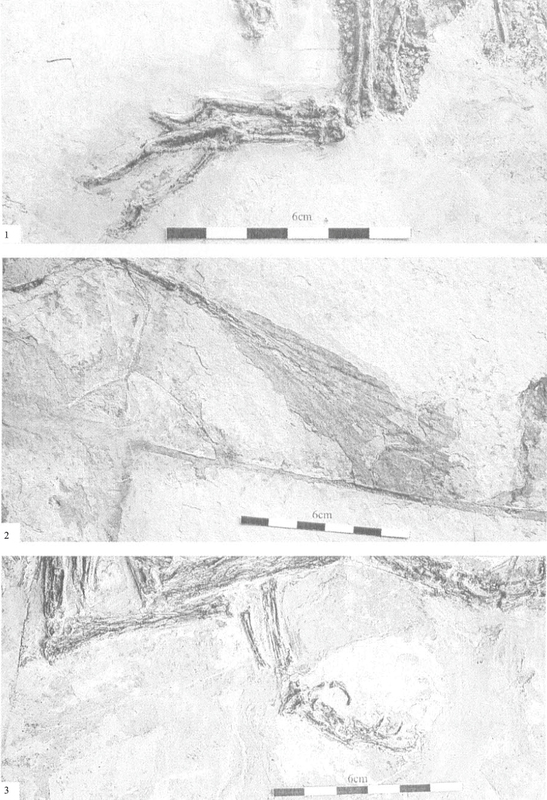 Did you find that these placements (as ornithomimosaurs) were not secure for any of these three? Did Timimus find a 'home'? I'm not asking where it was recovered, only if it was recovered in a (relatively) stable phylogenetic position? In the latest run, Tototlmimus is always ornithomimosaurian, but Aepyornithomimus is most often but not always, and Valdoraptor is most often a ceratosaur. Timimus emerged sister to Gallimimus bullatus, funnily enough. If you read Benson et al. (2012), they argue against ornithomimosaurian identity because Timimus supposedly lacks an aliform anterior trochanter, even though it and tyrannosauroids have one. They state "T. hermani also possesses a proximomedially inclined (‘elevated’) femoral head, a synapomorphy of derived tyrannosauroids (e.g., ; Tyrannosaurus ; Xiongguanlong ), that is absent in ornithomimosaurs", but Gallimimus obviously has one (Osmolska et al., 1972: plate XLVI fig. 1-2). Finally, they say the accessory trochanter has a different structure than ornithomimosaurs. Maybe true, but neither accessory trochanter structure nor anything more fine than an 'aliform' anterior trochanter has made its way into a TWG dataset, not even Brusatte et al. 's (2014) focusing on tyrannosauroid characters.